"How did the Queen take it?" "Upright and inanimate, same as always." There is a thought experiment that places a cat in a lead-lined box, and suggests the animal is at once alive and dead in a state of quantum uncertainty until the lid is unsealed and an observer may peek inside to discover its actual state of existence. While the Jury of Affably Ethical Peers might consider this rather a cruel experiment from the cat's perspective, much a similar predicament befell Queen Victoria of England when it became necessary to seal her within the life-preserving casket of a speciality iron lung. Thus, Schrödinger's Monarch, or more simply Her Majesty, came to govern the Great British Space Empire. 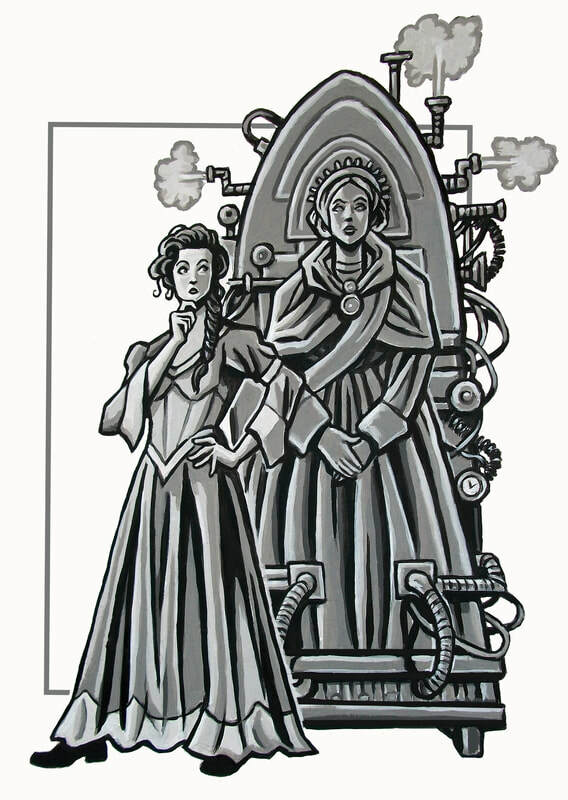 The mechanical ventilator known as Her Majesty was quickly knocked together by the Queen's Engineers in the aftermath of Victoria's debilitating accident, and has undergone near-constant modifications and improvements as technology has progressed throughout her reign. While the Queen simmers away in the bio-fluid within, the exterior of her capsule bears her likeness in solid bronze, surrounded by steaming pipes and vital fluid links. The monarch is able to communicate with the outside world through a ticker-tape issued from a small slot in her iron carapace, and dutifully translated by one of the loyal Stewards who keep watch over Her Majesty. Victoria's cast-iron presence remains absolute in the halls of Buckingham Palace, though her daughter the Princess Royal has taken up many of her more outgoing duties. Princess Victoria, having been introduced to her mother's new form as a child, remains unsure of the so-called Iron Queen, and would much rather see the Empress Supreme in the flesh—or else relinquish her grip on the Realm and her bizarre half-life in favour of her heir apparent.